Observers are applauding the European Tour’s renaming the 2018 Austrian Open as the Shot Clock Masters. Putting aside a potential piracy issue around borrowing the Masters Tournaments name, the whole idea of professionals being on a shot clock is intriguing. Unfortunately it doesn’t address the real world problem of slow play. By way of background, on every tour and at every amateur tournament there are strong pace of play policy statements but, at least on the PGA Tour, penalties are almost unknown. The most recent was a one stroke penalty handed out to Brian Campbell and Miguel Angel Carballo during the 2017 Zurich Classic but the previous penalized infraction was in 1995. The European Tour it seems is going to be more aggressive in changing the ways of snails-pace toursters and willing to try something new. 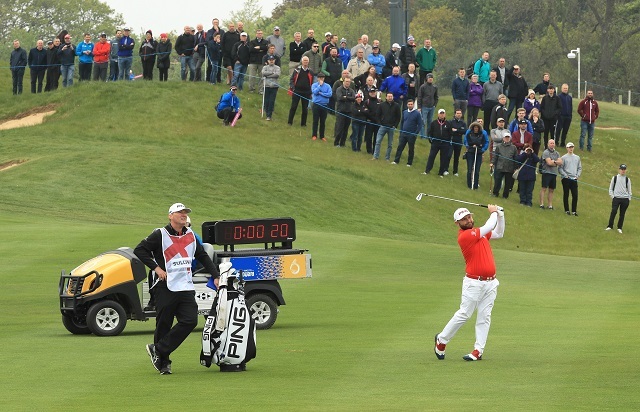 At their GolfSixes team event in May (an innovative format of team six hole matches) a shot clock was tested and most players accepted it enthusiastically. During the Shot Clock Masters an official will accompany each group and time players. Fifty seconds will be allowed for the player whose turn it is to hit first while others in the group will have 40 seconds. If a player takes longer he will get a red card, just like in soccer, and more significantly a one stroke penalty. In case of real trouble each player will get two “time outs” giving him double the time. It remains to be seen what will happen in an instance as when Jordan Spieth during the final round of the Open took 26 minutes for his second shot on the thirteenth hole from Royal Birkdale’s driving range. The Shot Clock Master will be interesting if for no other reason than to see what will be the ruling if one of the big name stars goes over the allowable time deciding on whether it’s a two-iron or three-iron from the rough around a tree over water to a shallow green. But let’s face it, some tour guys are fast and some are slow. Players and officials know who they are. You and I know the real problem is not with the professionals nor even elite amateurs, itâ€™s that group of guys ahead of you Saturday morning. There has been lots of research done and opinion voiced about pace of play ranging from less skilled players taking shot after shot without getting closer to the pin to the difficulty of course set up not to mention the distance between a green and the next tee. Some opinions are even based on a combination of ignorance and prejudice and usually have to do with ladies on the course. Or, my personal favorite perfecting illustrating the idiocy of some course managements, seven minute tee times. There are a couple courses in my area that do this and I won’t play there. These and other supposed reasons all miss the real cause of slow play, a lack of respect for others. If offending players respected those being tortured back in the fairway they would simply pick up and move ahead a hole or two. It’s not a privilege to watch the complete circling of every putt twice or going to the bag for multiple club changes. The attitude demonstrated has nothing to do with, “I paid my money and I’m going to play the whole course,” and everything to do with the deep seated knowledge they deserve to play at any pace because they are more important than the guys leaning on their drivers back on the tee. Unfortunately there probably isn’t any way to get the message across to the worst offenders not even the “While We’re Young” PSAs by Clint Eastwood and Arnold Palmer. Too bad because though the course is not the only situation where the “me-only” attitude can be seen, as far as golf is concerned it is surely killing the game slowly.